Easily removes limescale and debris that harbour a wide range of potentially harmful bacteria and fungi, including legionella. 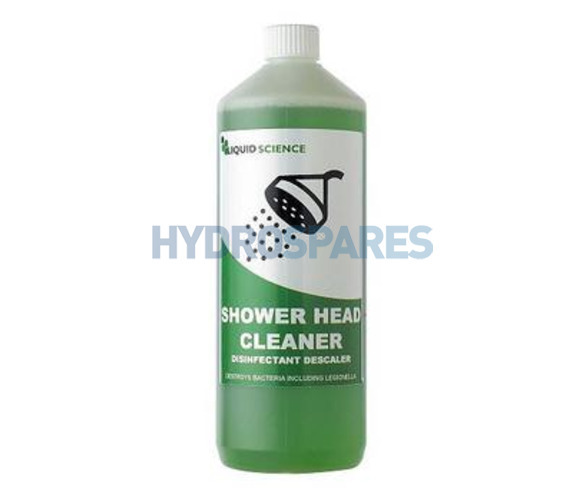 This unique & powerful formulation will help to increase the flow of water through cleaner shower heads & nozzles. Great for hard water areas where lime scale Is a problem. For a thorough clean, immerse your showerhead in a bowl of this solution, and watch it work its magic... the dirt will shift before your very eyes! 1 litre - 1-2 treatments (depending on size of showerhead). Excellent results from this product. Went around the house using this on all the showerheads. Soaking each and then scrubbing with a small nailbrush. Each one showed improved flow and looked clean and revived. This is pleasant to use though care must be taken to wear gloves and be careful with the product - read instructions. It works efficiently and quickly. It is also easy to apply. Hi, Does this product come in a larger size & can I get the safety data sheet for my COSHH records? Hello, no need to dilute, its not designed to be sprayed on, I think it would be less effective because it would not be able to get into all the nooks and crannies of the shower fitting where limescale & germs build up. Do the shower heads not unscrew from the pipework? Hi, I am working for a company with a gym and we have 10 shower room. but the shower head is big and it 's fix to the wall so it cannot be removed to soak in the bucket of chemical. will it be as effective as just spraying the chemical on the shower head and leave it for a while before rinsing. do I need to dilute the chemical?